Which trimester are you in: THIRD! Bump photo: Two of them actually! 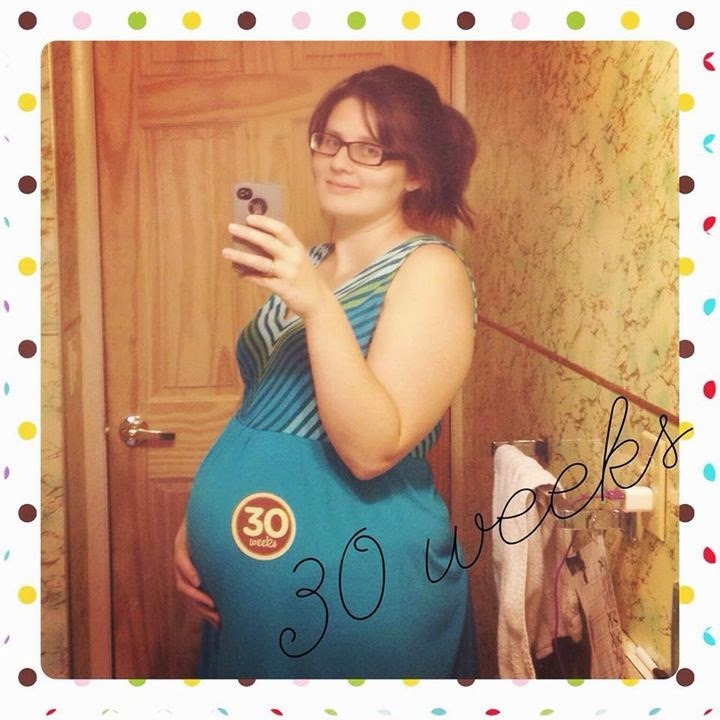 How big is baby: Average for 30 weeks is around 3 pounds & 16 inches long. So baby is about the size of a large eggplant! Pregnancy symptoms: More heartburn which stinks, but luckily it hasn't been too bad. It's definitely getting to be more of a challenge getting comfortable in the bed. Growing belly of course. Some leg cramps in the night (which I remember vividly from my pregnancy with Zeke) but bananas seem to cure that. Cravings/Aversions: I've been trying to cut back on sugar and that has proven to be a bit of a challenge. I had a MAJOR craving for mint chocolate chip ice cream the other night which my husband dutifully fulfilled for me. (I didn't go overboard though.) No real aversions at the moment. Sleep: It comes and goes. Most nights I try to read or watch a little TV and I don't even make it five minutes. The nights I'm awake are the ones where I'm fighting to get comfortable. Nesting: For sure. I said the organizing bug had bitten me and I wasn't kidding. I've always kept the kids clothes that they've outgrown and realized that I am a bit of a clothes hoarder. I've been trying to decide just what to do with the baby clothes since we don't know the gender. I have a lot of specific stuff (frilly pinks, football blues, etc.) and don't really want to get it ALL out yet. My mother-in-law suggested getting out the gender neutral and a little bit of the boy and girl items, mainly the smaller things until baby is born. Maternity Clothes: Do we even have to ask?! Weight Gain: I've gained since my last update obviously. Many people keep making the "twins" comments or saying how they don't think I'll go until my due date, which I'm sure they don't mean rudely (most of them, anyway) but I can't help but feel a little like they're all saying, "WOW. YOU ARE HUGE." It also hit me like a ton of bricks when I stepped on the scale at my appointment. However my midwife reassured me that the weight I'm at now I had hit 4 weeks before in my last pregnancy. She also took my measurements and let me know that we are measuring right on target for where we should be. Movement: Tons and tons and TONS. This is one active baby. It's changed from mainly at night time when I was trying to rest to now seeming like it's all the time. There's definitely resting periods but lots of activity. And hubby has gotten to feel & even see so much movement too! Gender: Still a surprise, of course. Aren't you guys going to be excited when I finally have an answer to put here? :) The ease of my pregnancy and lower heart rate are really making me lean towards boy, even though my initial gut reaction was girl. Concerns: Baby is breech and has been for my last 2 (3?) appointments. This isn't a huge big deal but now is the time when I'd like for him/her to be doing the acrobatics to get into the right position. I've been checking out SpinningBabies website (I almost said Flipping Babies, ha!) and I have been doing TONS of reading on breech positions/labor stories/research/etc. but with all this movement I've been feeling, I'm sure he/she will be flipped by our next appointment and I won't need to worry about it. I also had a health issue that came up but it's on it's way to being fixed. Best moment this week: Hearing baby at the midwife last week was wonderful as always. Heart rate was in the 140's like usual. Looking forward to: The holidays. Even though I'll be even more huge and probably waddling, I always enjoy the holidays and time with family. I am so excited for you and your family! 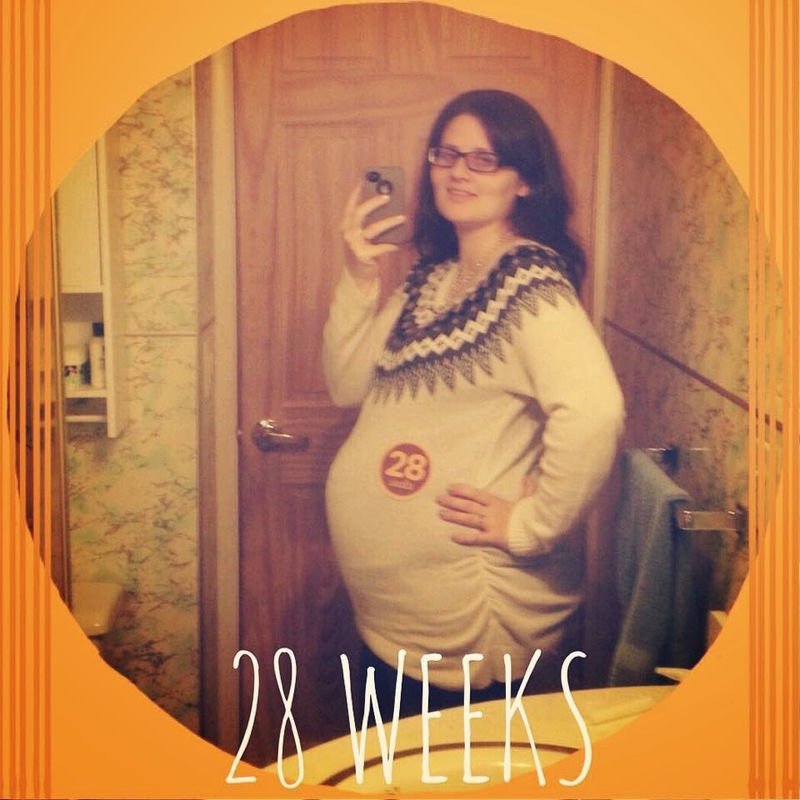 You are documenting your pregnancy beautifully. =) As for the baby clothes...I agree with your mother-in-law...get out the gender neutral stuff and a little bit of the gender-specific stuff and you'll most likely be all set - for a little while, anyway! Fingers crossed that baby #3 flips soon! Oh, and good luck with finishing up your doula coursework!